Our days here are certainly lazy and it feels like we are doing nothing. Today we venture out a bit to the east along the coastal road. Our destination is a mere 17kms or so away, but it seems to take forever in this long lazy line of traffic. 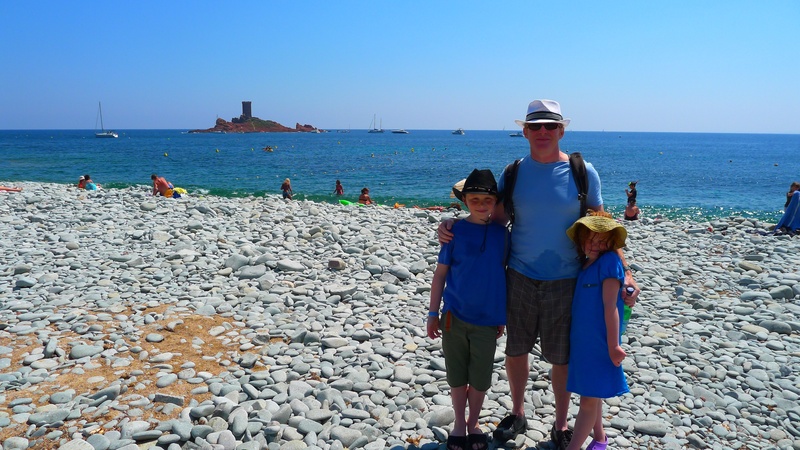 We are heading to Agay for a swim at a beach other than the one in Port Frejus. By the time we arrive at our destination, we realize that there is no shade on offer here – a bit of a deal breaker for us, so we turn around and head to a beach a little further to the west. This beach is the site of a major landing of American Troops in the second world war. Nine thousand boats and 450,000 troops. Mind boggling to imagine gazing out at the stretch of beach before us. Note the rocks in the photo below – they are important. So no sooner are we getting ourselves ready for a plunge when Lucy starts wading out of the water balling her eyes out. There is a man on the beach beside us clucking and shaking his head. We both assumed that she had fallen in the water and hit her head on a rock. But no. It soon same to light that Cooper had decided to throw a rock into the water and managed to aim it right at Lucy’s head and make contact. So she is bawling, Cooper is adamant that he threw the rock in a direction that nobody was in and we are dumbfounded by the whole thing. So we have a discussion with Cooper about his lack of awareness, check for blood and try to move along. Lucy is nursing a blood speckled lump on her head, but thankfully it doesn’t bleed. So we swim in the break and as we go under we can hear the rocks tumbling under the water as each wave recedes from shore, pulling the rocks with it. As is to be expected the kids are STARVING. 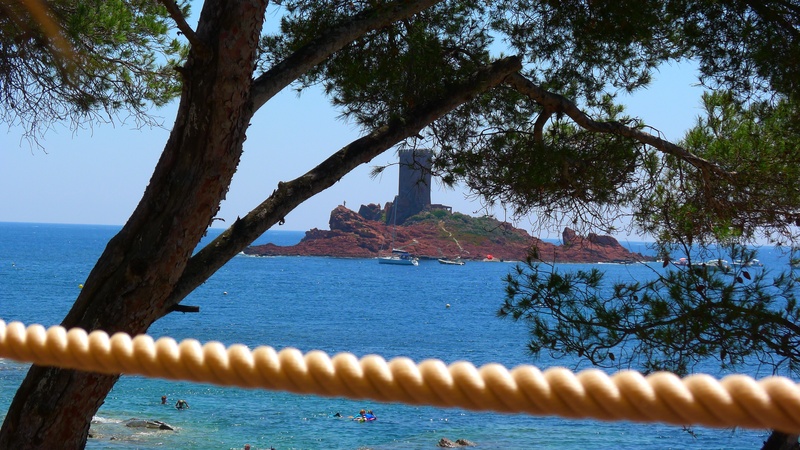 There is a restaurant, The Ile D’or, just down the beach so we head there for lunch. It couldn’t be in a more gorgeous setting. Afterward, we head down to this beach for a swim and quickly realize that it is full of fish. So we spend our time skin diving with the fish and having a ball. Head bonk forgotten.